• protection of natural resources and the environment. · For decision-making we create multidisciplinary team of strategic consulting on the operating company basis. Strategic Consulting Group - a group of highly qualified professionals, able to solve a full range of tasks associated with the development and exploitation of oil and gas fields. The group's goal - through continuous cyclic interaction between group members to deal with current, assigned tasks using most effective methods. Each of the problems is being solved with the application of an integrated approach and a different specialization expert’s participation. The main task of the group - a rational, efficient development of the field with increasing oil recovery index through deep data analysis, interdisciplinary interaction and application of the most advanced technologies in the industry. Application of modern software allows you to create and maintain permanent geological- technological models, to solve the above problems. 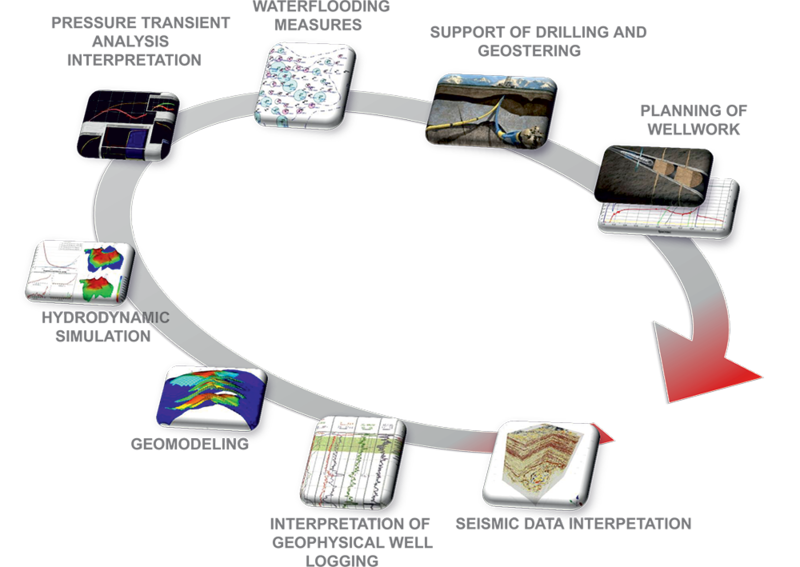 solution is being carried out by creating of hydrodynamic models of oil and gas deposits and fields and includes:core test of the reservoir, construction of correlation scheme, geological columns, countor maps and net oil thickness, geological and statistical sections, etc. most complex, requires highly skilled professionals. The solution of this problem gives an idea about the nature of the development and structure of remaining oil in the area of ​​interest in the region of ​​tested well. Construction of geological-statistic section; probability of reservoir flooding, inclusion of desaturation intervals in extraction; expert determination of current reservoir saturation in the area of tested well. solution to this problem gives information about capacity of field to produce in the area of tested well and includes: study of technological parameters of the tested well and nearby wells operation; analysis and comparison of perforation intervals; hydrodynamic study of wells analysis; plotting functions, which characterize geological and technological conditions of the well operation; generating of current drainage maps, current reserve density maps, etc.